Lake Anna is one of the largest fresh-water inland lakes in Virginia, covering an area of 13,000 acres (53 km²). The man-made lake is formed by a dam on the North Anna River. By 1972 the lake bottom was cleared of all timber and the dam was nearing completion. It was projected to take 3 years to completely fill the lake, but with the additional rainfall from hurricane Agnes, the lake was full in only 11 months. The first communities broke ground at about that same time and from that beginning, the lake has grown to over 120 different communities dotting the shore. Lake Anna is approximately 17 miles long from tip to tip, with some 200 miles (300 km) of shoreline. Gaining in popularity as a vacation destination, a retirement destination, and a 2nd-home location for many, the artificial Lake Anna offers swimming, sailing, boating, world-class fishing, and multiple annual triathlons. Surrounding attractions include vineyards, antique shopping, golf, historic sites, theme parks, and hiking. Own a boat or other personal watercraft? Lake Anna offers many different waterfront living options including large homes and townhomes. Coming soon, Lake Anna will offer waterfront condo living! Owning a home on the waterfront of Lake Anna gives you the ability to dock your boat at your home to get the most out of the lake. Not purchasing a water front property? No worries, there are various marina’s available that rent both covered and uncovered wet slips to make boating easy and convenient! Don’t own a boat? Consider renting one from one of the various local marinas and businesses. Sailboat enthusiasts will prefer the more open, wide water appeal of the southern end of the lake (note: the lake’s several bridges, including the main 208 bridge, are too low for a sailboat to pass beneath). Water sports junkies tend to enjoy the mid-lake area, while the fishing crowd has lots of hot spots in nooks and crannies of the northern “on Golden pond” end. 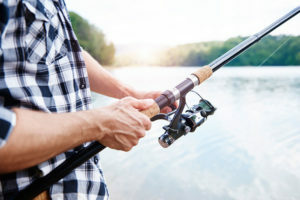 Anglers fish for over 30 species of fish including largemouth bass, striped bass, walleye, catfish, crappie, bluegill and white and yellow perch. Weekly fishing leagues keep our full time and local residents happy while sanctioned tournaments bring fishermen and women from afar. Lake Anna is divided into two sides: the public side (also known as the ”COLD” side) and the private side (also known as the “HOT” side). The public side is roughly 9,000 acres (36 km²), while the private side is roughly 4,000 acres (16 km²). The private side is formed of three main bodies of water, connected by navigable canals. The public and private sides are divided by three stone dikes. The private side has no marinas or public access ramps; therefore, only property owners have access to the waters of the private side. The public side has several marinas and boat launches, including the state park. Therefore, the public side sees significantly higher boat traffic than the private side, especially on summer weekends. Let Lake Anna Island Realty be your guide to finding the perfect home on the Lake! The Boardwalk on Lake Anna is the home to Tim’s at Lake Anna, Wake Edgers Gifts and Gear as well as an eventual hotel and various retail outlets. The Boardwalk is located down the North Anna River past the Christopher Run Campground. The plans for this area also include a recreation area that will contain a miniature golf course and batting cage. Tim’s has two other popular locations including Tim’s Rivershore and Tim’s II in Fairview Beach. Tim’s at Lake Anna will provide the same restaurant and crabhouse dining that is available at the other two locations. It is rumored to also provide a water shuttle from popular locations on the lake for those who want to enjoy the atmosphere but don’t want to drive, or boat, back! Lake Anna Island Shops is home to various different businesses and conveniently located next to the 208 bridge. Lake Anna Island Shops offers dining options with Ally’s Restaurant and the Asian Diner. In addition, here you will find the Lake Anna Yacht Club as well as Fisher’s Gym. Lake Anna Island Shops is also the home to Lake Anna Island Realty!